A newborn is expected to lose some weight during the first five to seven days of life. The American Pregnancy Association suggests that a 5 percent loss is normal for formula fed newborns and a 7 to 10 percent loss for breastfed babies. Sometime between days 10 and 14 after birth, the infant will return to birth weight. Parents can monitor this at home. Or, routine pediatric appointments will include weighing the baby and calculating the percentage of weight loss. 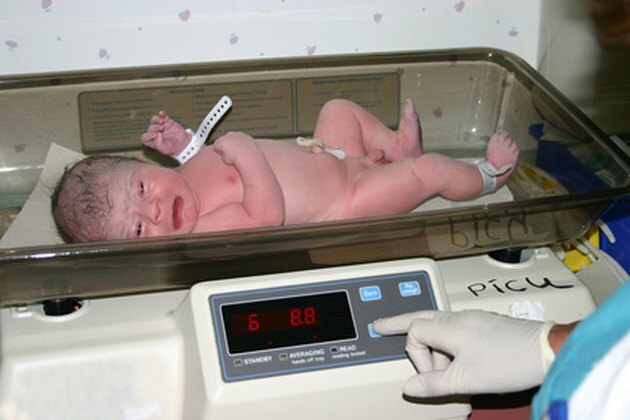 Record the infant's weight at birth. Place the completely undressed baby on an infant scale. Wait for the baby to lie still before noting the number on the scale. Subtract the current weight from the birth weight. This is the amount of weight lost. Divide the weight loss number by the birth weight and multiply it by 100 to get a percentage. To convert ounces to a round number for the calculation, divide the ounces by 16. The number 16 is used because 16 ounces equal one full pound. Compare the percentage of weight lost to the suggested numbers provided by the American Pregnancy Association or a pediatrician. In addition to monitoring weight loss numbers, caregivers can count weight or dirty diapers to get an idea of how much the baby is consuming. Five to six wet diapers and three to four dirty diapers in one day suggests the infant is eating well, states American Pregnancy Association. Despite eating well, the infant may take a bit longer to return to birth weight. Report significant percentages to a health care provider right away, especially if the infant was premature, ill or has feeding problems.